Lincoln-based Venture Signs & Graphics Ltd recently installed an Epson SureColor SC-S30600 printer to expand its print capabilities and bring more of its wide format print work in-house. The company bought the printer from SMGG, the commercial graphics division of Stanford Marsh Group. The SureColor SC-S30600 Printer was selected for its efficiency and reliability, alongside its excellent reputation for printing on vinyl media. Venture Signs is primarily using the SureColor SC-S30600 for sign-making applications and vehicle graphics; the printer recently enabled Venture Signs to tackle a 50m hoarding print job with no difficulties whatsoever – something that would have been nigh-on impossible prior to the installation. 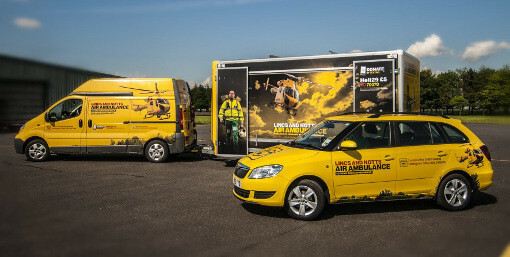 Another eye-catching project is the company's use of the SureColor SC-S30600 to print vinyls for wrapping eight support vehicles and two exhibition units for the Lincolnshire and Nottinghamshire Air Ambulance. Venture Signs & Graphics was contracted to print and fit the required liveries and graphics to the various vehicles and units and was subsequently praised for the quality of its expert printing and application services; the fleet’s distinctive yellow livery with the charity's branding is said to have helped the helicopter and supporting exhibition unit to attract a 30 per cent increase in visitors at the recent Waddington Air Show. Designed to offer efficient and environmentally-friendly production at the lowest total cost of ownership, the SureColor SC-S30600 enables print businesses such as Venture Signs to cost-effectively expand their service offerings. It can produce everything from posters, signs, banners, backlit panels and POS to vehicle wraps, interior decorations and exhibition displays. With a wide range of roll media supported, users can reliably and cost-effectively print on vinyl, canvas, clear film, photographic paper and a range of popular banner substrates, at up to 64-inch (162.6cm) width. By enabling Venture Signs to bring previously outsourced work in-house, the Epson machine gives the company greater control over the quality of the output it delivers to its customers. When purchasing the SureColor SC-S30600 wide format printer, Venture Signs also purchased an Easy Mount EM 1600 SH laminator and Wasatch RIP software. They also benefitted from a free-of-charge Epson SureColor Academy training day which ensures that end users can get the very best results from their new printers.